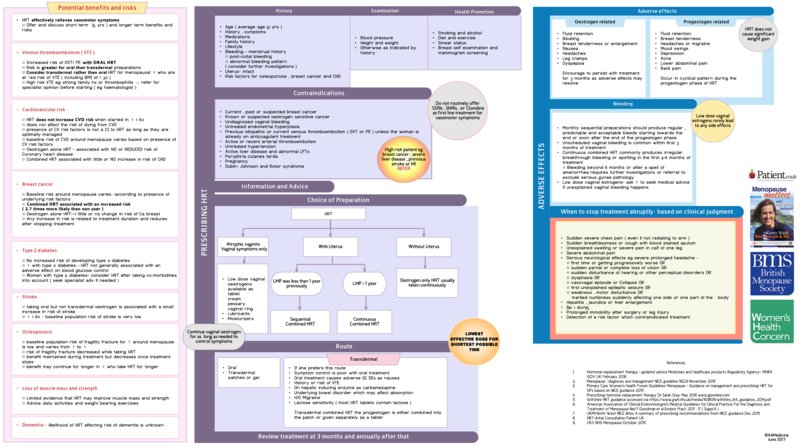 Hormone Replacement Therapy overview chart on A4Medicine presents the general practitioner with a clear description of associated benefits and risks. An initial assessment and examination are followed by a clear list of contraindications. A simplified flow chart helps in choosing the right preparation. Use of transdermal preparations can be suitable in certain circumstances and the clinician can quickly review that. The focus is also on SEs and when to stop treatment. Tibolone is rarely used or initiated in primary care and has not been included in this review of hormone replacement therapy.